The Solar iBoost concept is to use the surplus solar PV energy generated at your home to heat the hot water in your household water tank and save you money. Fit a Solar iBoost and watch your heating bills fall! 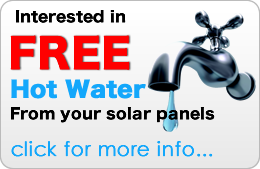 In a household with a PV array generating 2kW surplus, just 2.5 hrs is needed is needed to raise a 100L tank temperature from 20°C to 60°C giving a saving of approximately £0.50 per day based on average energy prices (Feb 2013). 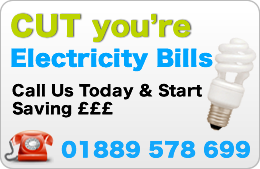 How does it affect my Feed in Tariff (FIT) Payments? It doesn't. Solar iBoost does not affect your FIT generation payments. ; Where you have a "deemed" usage contract with your FIT provider you will be paid for the export value regardless of whether the energy is consumed or not. This is normally based in 50% of the generation reading and will not be affected. Where an export meter is fitted with the benefits of the Solar iBoost can still easily outweigh the rising energy costs of water heating. A single battery operated radio sensor clamps around the household mains input cable so there's no need for expensive wiring. 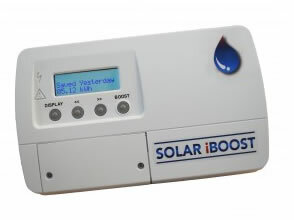 The sender monitors the flow of electricity and transmits this information to the Solar iBoost. There's no need to change your immersion heater as Solar iBoost works with any normal household immersion heater rated up to 3kW. Also suitable for use with dual immersion systems.